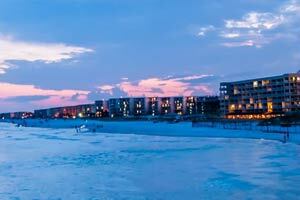 Miramar Beach has a simple, serene vibe, perfect for escaping the crowds. Grab your visor and racquet, and go. The clubhouse and game room have your back. Located on 650 feet of beach. Your kids will love the kiddie pool and the arcade. This low-key, mid-rise condo resort is positioned right in front of a prime stretch of the more mellow Miramar Beach. Beach House Condominiums is a classic seaside retreat, harkening back to the charming resorts of another era. Relax by the seaside pool or stroll down to the beach and park yourself in a lounger indefinitely. There’s a game room and clubhouse, on standby for rainy days and perfect for the winter months. Gather ‘round in the afternoon for a cookout on the grills and bust out your enviable BBQ skills. Tennis players will appreciate the lighted tennis courts, and fitness buffs can spend some quality time at the gym. The resort also has an event space for weddings. Condo rentals at Beach House Condominiums feature spacious balconies, living/dining rooms, plus full kitchens for your group’s help-yourself breakfast free-for-all. - Front Desk is open 9:00 AM-5:00 PM daily. Guests who arrive outside normal front desk hours must use the after-hours phone located outside of the front desk to receive lock-box codes with keys to the unit. For more details please contact the property using information on the booking confirmation.